The sweetest little birds in the world deserve nothing less than the sweetest little houses in the world. And we do mean sweet. 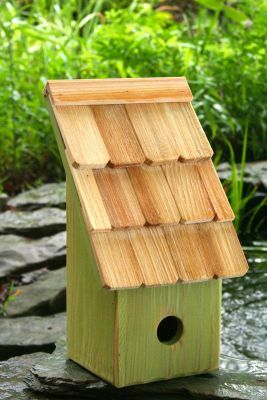 Heartwoodâ€™s small wren Fruit Coops are an artful gathering of all the best features that attract birds and bird lovers: Natural beauty and comfort, plus durable cypress construction in a bountiful harvest of fruit colorsâ€” green apple, pumpkin, grape, pear, mango, blueberry and fig. Adorable alone, these little beauties are even better together. So buy them by the bunch and have your yard or garden blooming with color and bursting with song. 1 1/8" hole size.